The purpose of this document is to describe the available individual permissions that can be enabled for each role and how you manage these roles in Admin. 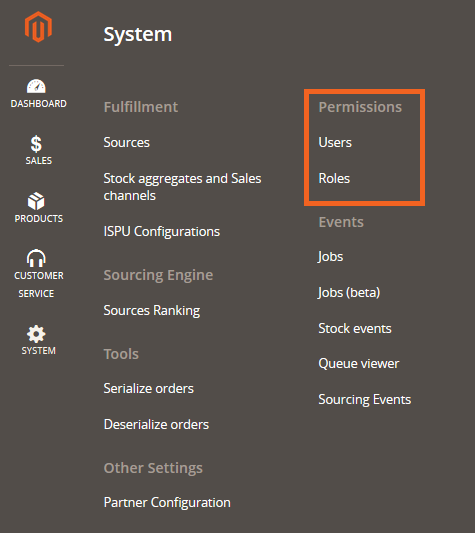 In System > Permissions you can access both the Users, where you create a new user, and Roles, where you set permissions for a user, sections. Both roles and users are fully configurable to meet your unique permissions needs. A role defines which actions a user is able to execute within the system. Create roles first, then users assigned to those roles. An administrator should be granted a role with a value of 1 in the Hierarchy field, which gives them the permissions to create additional roles for others as needed. With this permission they can define role names and check permissions to be granted to users per role (via the tickbox in the Resources section). Roles with a hierarchy of 1 have the ability to view other roles with a hierarchy of 1, as well as all roles with a hierarchy greater than 1. Roles with a hierarchy of 2 are not able to view roles with a hierarchy of 1 or other roles with a hierarchy of 2. They can only see roles with a hierarchy of 3. Roles with a hierarchy of 3 are not able to view any roles in the Roles view. Once roles have been defined (see the Add a role section below) a new user can be created and assigned to the role. Add a name for this role and set the hierarchy. Tick the applicable Resources options for this role. Tick None, All Sales Channels, or Specific Sales Channels to select which, if any, sales channels this role should have access to. If Specific Sales Channels is selected, search for and select, or tick, the desired channel options and click Done. When you navigate back to the Roles page a list of all the Roles that have been created will be displayed. Click Delete for the role you want to remove. Click the name of the role in the left-hand column of the Roles page. Edit the Name, Hierarchy, Resources, or Stores options as desired. You cannot filter information by source and store, so you must define one of them. If a user has one or more sources selected as part of their defined role, all active pages as defined for the role will only show details for the selected sources. Typically, omnichannel users are interested in source filters and single channels in store-level filters. A user is an individual that has a particular role within an specific environment. A user can perform specific actions based on their configured role, and they can see relevant information based on the permissions assigned to them (via their role). Once a new role is created you can create a new user and assign a role to the user. When creating a user, it is important to specify which sources the user has access to: None, All Sources or Specific Sources. If Specific Sources is selected, search for and select, or tick, the desired channel options and click Done. For instance, a store associate role will most likely be interested in only seeing orders that have been sourced to their applicable source (the one designated for their store), so will only need access to that source. Role - Choose their role, such as Super Admin, admin, Store assistant, Customer service agent, etc. Allow access Sources - Select the applicable sources for the user: None, All Sources, or Specific Sources. By default, None will be selected. If you selected None, the user will not have access to any source and pages with source filtering capabilities will display an error message. If you selected All Sources, there is no source restriction for the user. When a new source is created, the user will automatically have permissions to see related data for the pages they have access to. a. If you selected Specific Sources, search for and select, or tick, the desired options and click Done. When assigning sources to a user (or updating a current user), you will only see sources available for the User role you selected. The new user will receive an email from Backoffice User Service containing a password reset link. In order to access the admin interface new users are required to reset their password. When you navigate back to the Users page you will see a searchable list of all configured users, showing user name, e-mail, User role, and whether or not they are active roles. This option is ideal if you want to create many users at one time. Click Download template and populate it with multiple user’s information to do a bulk upload and configuration of a set of users, or to update existing users. Click Choose File, select your edited template, and click Upload. The new users will receive an email from Backoffice User Service containing a password reset link. In order to access the admin interface new users are required to reset their password. You can also edit existing users by clicking Download CSV and editing the information as explained. Currently, there are two different permissions models: User Restriction Filter and Restriction based on both, Sources and Sales Channels settings. The UserRestrictionFilter configuration, for which the value can be source or store, will define which of the values will be used to filter the information in Backoffice. You cannot filter information by source and store, so you must define one of them. If a user has one or more sources selected as part of their defined role, all active pages as defined for the role will only show details for the selected sources. This new configuration allows for the flexible assignment of sources and channels. Backoffice pages are filtered based on User - source permissions and Role - sales channel permission when the new RestrictionBySourceAndSalesChannel configuration is enabled. It is easy to see when a page is filtered only by Source (column one) and only by Sales Channel (column two) but, what does it mean when a page is filtered by Source or Sales Channel (column 3)? We validate if the user has access to the Sales Channel of the order. If this validation fails, then we check the user access to any of the sources of the order by using the shipment requests. If a user has a role with access to the Sales Channel of the order, they will see the details of the entire order (regardless of their access to the source). If an order has at least one line that is ISPU with collection in the source, then the user will have access to the full order. If an order has at least one line that is/was sourced to the source (and not pick declined) then the user will see the details of the entire order (regardless of their access to the source). If the shipment request was fully pick declined, it shouldn’t be considered. Example: The Store A store associate, who only has access to source A and no Sales Channel can see orders that were allocated to source A. If the order is fully pick declined from source A, this store associate will not see it. If a user has a role with no access to any Sales Channel and the order is in the “Pending First Shipment Request” status, the user will see a 403 error. These definitions are configured, and can be enabled, in your System Integrator (SI) Portal, which is not accessible externally yet. Contact your Customer Success Manager (CSM) or Technical Account Manager (TAM) for assistance. Sales Channel Manager or Customer Service Representative No 1 - Sees only orders affected to his Sales Channel. - Will not use the store fulfilment screens. - The CSR has more restrictions on pages than the SCM. Store Associate (Internal) 1 All - Uses store fulfilment screens for their own store. - Will be able to see all the orders. - Sees the source inventory of all sources (if given access to the Source Stock page). Store Associate (Franchise) 1 1 - Uses store fulfilment screens for theikr own store. - Sees only orders that are affect their store or were shipped/collected from their store (partially or fully). There are eight different areas of permission: Sales Management, Customer Service, Order Modification, Stock Management, Omnichannel Management, Reports, Configuration, Internal Tools. See the permissions their descriptions below. Manage stock aggregates Allows the user to display, create and update the configured sales channels and stock aggregates. From the stock aggregates page the user can update which sources are associated to the aggregate (meaning will provide the stock to be aggregated for the final available to sell stock for the frontend provider). Here the safeties stock at aggregate level can be configured for each item status (default, outlet, end of life). Manage catalogue Provides visibility into all items and options created in the OMS catalog and allows to manually create new items/options. System > Roles page, users with permissions to this page will be able to update roles with the limitation of the hierarchy as a user will never be able to make a role with a higher hierarchy as his own. In the past, if a role needed to have visibility to orders that have not yet been sourced (such as orders pending sourcing, backorders, and pre-orders) the role was required to have access to all Sales Channels/Sources. To achieve this, there was a Allow access to all Sales Channels/Sources configuration in the user view, which allowed visibility to those orders without applying filters. Existing clients will have the configuration enabled but hidden in Backoffice. The AccessToAllSources option will be enabled (not the AccessToAllSalesChannels, because it could give additional permissions to other users that the merchant does not want because the Sales Channels are configured at the role level insteasd of the user level). If an existing user with this enabled configuration changes from All to None or Specific User, the AccessToAllSalesChannelsAndSources option will be disabled and this user will need to use the new configuration. If an existing role with this enabled configuration changes from All to None or Specific Role, the AccessToAllSalesChannelsAndSources option will be disabled and this user will need to use the new configuration.